The IRPM Associate Exam is accessible through two routes. Candidates can self-study the IRPM syllabus via the IRPM's Scottish Open Learning Course (SOLC) and additional resources which are signposted within the SOLC. 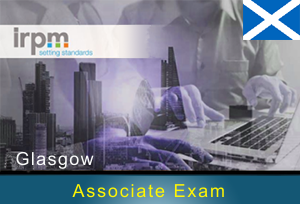 The booking form for the next Scottish Associate Exam scheduled for Wednesday 28th February 2018 in Glasgow will be available to download soon. Candidates can complete the program “A Foundation in Factoring” locally in Scotland provided by SHARE containing six individual 1 day training sessions and a ½ day assessment. Candidates will be provided with workbooks at each module and preparation for the assessment will include learning and revision of the workbooks. A separate ½ day session is available on the morning of the assessment for those who require some last minute revision. Training courses for the Scottish IRPM Associate Exam are available to view here. We offer a reduced rate for those who have failed the Associate exam who wish to re-take it. Please refer to the exam booking form.